I’m in Goa. The evening breeze is heavy and warm, begging for a cup of tea (always). My hair is frizz (see new Insta profile pic please) unleashed and for the first time in my entire life, I love it. This is where I come from. Every single thing in this world is the reason I’ve become this shy, easily annoyed, colour-crazy, brown as the red dirt human. Truth: I’m the MOST excited person to have stepped through the timespace portal that is air travel. Especially since I have a love hate relationship with planes. Our journey was long and my movie-watching plans ended 2 hours after we got on the plane. I couldn’t read a book and the entire time was spent looking at the guy with the window seat who slept for 9 hours straight taking breaks to watch The Minions and eat this cute airplane lunch we were served. Maybe I shouldn’t have got a full night’s rest but I did and contrary to all my claims about procrastinating, I was all packed at a reasonable hour, leaving more room for me to mop the kitchen and break down many many many boxes for recycling. I even made spring rolls and special peanut sauce. I am SO strange. But I’m here now and I’ve stopped falling asleep at 10 am for no reason. It gives me a lot more time to learn things I’ve been putting off for too long. Food things, of course. The day after we arrived, there was a handi of the orangiest kodi (curry) full of prawns on the stove. It was Sunday. I had no interest in eating anything else and though I never spelt out this wish, it was heard (thanks Mama and D). Every Goan person dreams of coming home to this same sight and smell. It’s the clearest sign that we’re back on this land where we took our first steps. That and we get drowsy after lunch – unfailingly. I did both. I pestered my father for a whole week before he taught me how to make curry. By taught I mean, he estimated every single ingredient and I shoved them in spoon and cup measures to try and make it scientific. It’s not. It never will be. It’s a beautiful thing to cook from instinct and that’s the only way home cooks know how. My numbers on ingredients were my only contribution to this recipe, along with the photographs. All the other parts are owed to years of practice and tweaking. My mother makes her curry masala paste with cumin but my father thinks “it’s wrong” (it’s not). My dad makes his curry masala with fresh tomato because he likes the taste. However you wish to do it in your home, it’s hard to be wrong when you keep the base ingredients the same. I’ve got a lot more from Goa recipes coming up. They might be on their own schedule but it will happen. Till then, ahhhhhh I’m HOME!!! The fresher the seafood, the better it tastes. We used the chunky bones of a fish we call Chonak in Konkani. The English name for this fish according to this site is Giant Sea Perch. We have also used shrimp heads, fish filets, raw mango, bhendi (okra), thick cubed turnip….all of the flavours! Be creative. This recipe uses Kashmiri chillies, which are less spicy than the local chillies (called ghati chillies). We use Kashmiri chillies at home. If you choose a spicier one, use less than what’s called for. Again, it totally depends on your palate. The curry thickens the next day while it sits in the fridge, which is something to remember if you’re making it in advance. To thin it out, just add more water while reheating it. You can buy all these ingredients at your local Indian grocery store, if you’re not living in India of course. Over here we just call them “shops”. 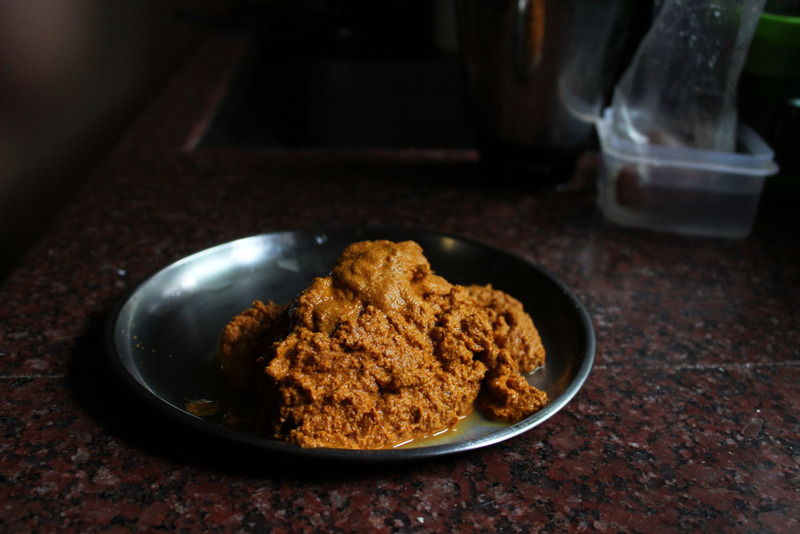 If you’re cooking for fewer people, you can freeze the rest of the masala paste for up to 2 weeks until you’re ready to use it. Add the first nine ingredients in the list to a high speed blender, food processor or mortar and pestle and grind till it has a gritty sand-like texture. Once all the spices are ground, add the coconut and about 1/4 of the water to start with. Grind them together for a minute and add more water to the mix. Scrape the sides of the blender and grind the ingredients some more. Add more water but only a tablespoon at a time. Once the coconut mixture starts to resemble a smooth bright orange paste, it’s ready (see pictures). Keep the blender/food processor unwashed. I’ll let you know what to do with it in the next step. If you want your masala paste thinner (which my father said I needed to do), grinding it with more water will do the trick. Alternatively, you can also thin it out while cooking it. Place a medium-sized pot on the stove on medium heat and add oil. When the oil is hot enough (about a minute) add the remaining 1/4 cup onion to the oil. Stir it around the pot for a minute until they turn soft. Add your curry masala to the onions and stir until the two elements are combined. Do this for about 2 minutes. Add about 3 to 4 cups of water to the pot and bring to a simmer. At this point, you can pour this water in the blender or processor and clean it out of all the delicious masala still stuck in before adding it to the pot. If you want your curry thicker or thinner, you will have to add more or less water. Bring the curry to a slow boil on medium heat. Once it starts to boil, turn the heat down to a simmer and add the fish to it. Let the curry simmer for 5-7 minutes or until the fish is cooked. Season with salt and take the curry off the stove. Serve it warm over rice and enjoy! It’s the BEST of Goa. My mom makes the kodi almost this way…i learnt it from her when in Oman, and I must tell you how much I loved making it. Each time I made it, i experimented with the ingredients…adding a little or more of the other. We use the same recipe for bhindi aani sungtachi kodi (Okra and prawn curry) too. It’s delicious. Also, am so glad you are in Goa. Contemplating a weekend visit to see you. Let me know when you are free next month. Thank you for saying so. My parents’ recipe is a good one.